The chariot, towering, threads the fiery sphere, And rises thence into the lunar reign. This, in its larger part they find as clear, As polished steel, when undefiled by stain; And such it seems, or little less, when near, As what the limits of our earth contain: Such as our earth, the last of globes below, Including seas, which round about it flow - taken from the poem, Orlando Furioso, by the Italian poet and diplomat, Ludovico Ariosto in the early 1500's. We found it fitting to name these knobs and pulls of strong character and design after him. 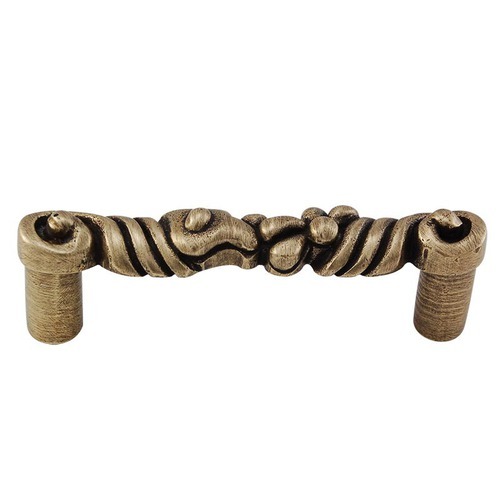 Solid pewter three inch pull is available in Antique Brass, Antique Copper, Antique Gold, Antique Nickel, Antique Silver, Gunmetal, Oil-Rubbed Bronze, Polished Gold, Polished Nickel, Polished Silver, Satin Nickel, Two-Tone or Vintage Pewter. Mounting hardware is included. 100% lead free pewter. Handcrafted in the USA. The chariot, towering, threads the fiery sphere, And rises thence into the lunar reign. This, in its larger part they find as clear, As polished steel, when undefiled by stain; And such it seems, or little less, when near, As what the limits of our earth contain: Such as our earth, the last of globes below, Including seas, which round about it flow - taken from the poem, Orlando Furioso, by the Italian poet and diplomat, Ludovico Ariosto in the early 1500's. We found it fitting to name these knobs and pulls of strong character and design after him. Available in Antique Brass, Antique Copper, Antique Gold, Antique Nickel, Antique Silver, Gunmetal, Oil-Rubbed Bronze, Polished Gold, Polished Nickel, Polished Silver, Satin Nickel, Two-Tone or Vintage Pewter. Mounting hardware is included. 100% lead free pewter. Handcrafted in the USA. The chariot, towering, threads the fiery sphere, And rises thence into the lunar reign. This, in its larger part they find as clear, As polished steel, when undefiled by stain; And such it seems, or little less, when near, As what the limits of our earth contain: Such as our earth, the last of globes below, Including seas, which round about it flow - taken from the poem, Orlando Furioso, by the Italian poet and diplomat, Ludovico Ariosto in the early 1500's. We found it fitting to name these knobs and pulls of strong character and design after him. Solid pewter, nine inch appliance pull is available in Antique Brass, Antique Copper, Antique Gold, Antique Nickel, Antique Silver, Gunmetal, Oil-Rubbed Bronze, Polished Gold, Polished Nickel, Polished Silver, Satin Nickel, and Vintage Pewter. Mounting hardware is included. 100% lead free pewter. Handcrafted in the USA.